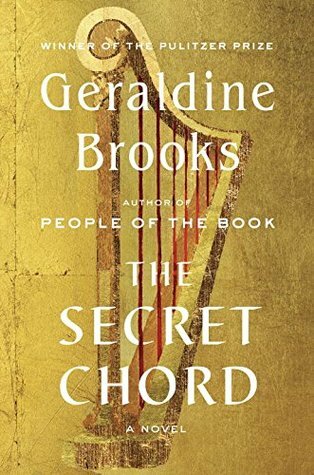 In her newest novel, Geraldine Brooks takes on the life of the Bible's King David. The story is told in the first person by Natan, who is David's adviser, prophet, and friend. It begins with a meeting between the two men, in which David asks Natan to write his life story. He sends Natan to visit three people who can recount his early life before Natan entered it, and they are not necessarily flattering portrayals. Through Natan's interviews we learn about David's life through his young adulthood, and the rest we learn from Natan. This is not so much a plot-driven story as it is a fictional biography. Natan began having strange visions of the future when he was still quite young, and it was this that both saved his life and brought him to David. These visions were the only part of the novel that were remotely supernatural; it was otherwise a pretty down-to-earth portrayal. David was complicated and flawed and I found him kind of fascinating, especially how he acted towards his many wives and his horribly-behaved sons. Although this story is more or less Biblical, it's not religious. I would even venture to say that actual Christians might have some issues with how David is portrayed here. As you might expect if you're familiar with Geraldine Brooks, reading this story was an immersive experience. I don't recall reading another novel set in Biblical times, so a lot was unfamiliar but she brought it to life quite vividly. I really sort of felt like I was being plunked down in the middle of a strangely different time, without many explanations, which is how all the best historical fiction should work. It sort of made me want to look stuff up, and if I was a less lazy person I would research things like the practice of rending one's garments and putting ashes in one's hair as an expression of grief. Many of the characters had similar names and they were difficult to keep straight. I did ok until about 50 pages from the end when I suddenly felt like I didn't know who anybody was anymore. I also was a bit confused about the timeline; early in the novel when Natan interviews a few people about David's life, he also thinks back to his own introduction to David and then as the story moved forward I kept thinking it was before those interviews, when in fact it was after. I'm not sure why that was the case - the writing or my own lack of comprehension - but although I kept expecting the story to catch up to that part, it didn't diminish my enjoyment of it. Despite the well-drawn characters and the drama in their lives, I never felt the sort of connection I did with the young female characters in Caleb's Crossing and Year of Wonders. Still, I think anyone who likes historical fiction, and who may want to try an under-represented time period, would find something to enjoy in this novel. 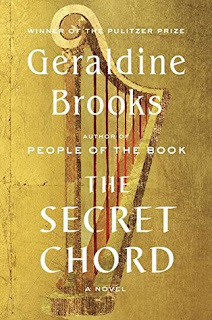 The Secret Chord will be available on October 6. I received my copy from the publisher via Goodreads. I was not compensated for this review. I still enjoyed reading it, and you might have a different experience so don't pass it by based on my opinion alone!